7.7 Earthquake hits southeastern Alaska. Tsunami alert issued. A small tsunami has been observed at Port Alexander, Alaska. 5.4 Earthquake hits the Ryukyu Islands off Japan. 5.1 and 4.7 Aftershocks hit southeastern Alaska. 5.1 Earthquake hits southeast of the Loyalty Islands. 4.9 Earthquake hits off the coast of central Chile. 4.9 Earthquake hits eastern New Guinea, Papua New Guinea. 4.9 Earthquake hits Halmahera, Indonesia. U.S. officials shift shipping lanes off California to reduce chance of collisions with slow-moving whales. Express train kills herd of wild elephants in southeastern India. The wildfires on the Tasman Peninsula, east of Hobart, have claimed least 80 properties and left thousands of people isolated overnight. 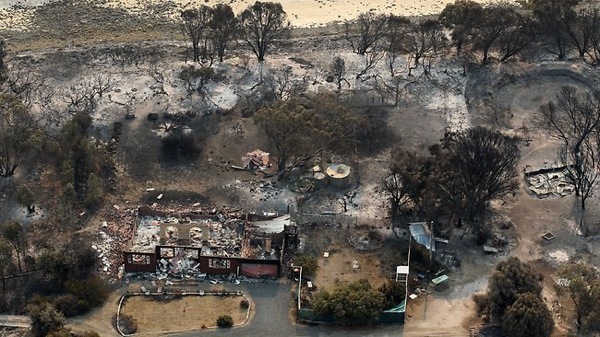 Almost 30% of properties in the town of Dunalley were destroyed. A major highway has been re-opened as interstate crews get set to fly in to help the fire-fighting effort. Brazil’s Northeast is suffering its worst drought in decades, threatening hydro-power supplies in an area prone to blackouts and potentially slowing economic growth in one of the country’s emerging agricultural frontiers. Heavy rainfall caused flooding throughout the Eastern Province of Sri Lanka. Thousands of acres of paddy are also affected due to rains in the Ampara district. Cyclone also damaged thirty one houses in the Polonnaruwa District. Around 15 houses in Medirigiriya, Nagahapura,Senarathpura MInippuragama. and another 15 houses in Lankapura, Kaduriwela East, Batathuna village and one house in Palugasdamana were damaged. Residents of Peragirigama, Kataragama in Lanka experienced yellow rain! Tropical Cyclone Dumile has moved away from La Reunion Island and Mauritius. As of 12:00 TS Sonamu was located 350 nm east-southeast of Ho Chi Minh city, Vietnam. Tropical storm Sonamu is forecast to strike Malaysia on 8 January. Eight climbers rescued and two are still missing in snowstorm on Mount Chokai on the border of Akita and Yamagata prefectures. 4.8 Earthquake hit the Kermedec Islands, New Zealand. More than 70 per cent of the continent is currently experiencing heatwave conditions. Among the hottest parts of the country on Friday were Wudinna, on South Australia’s Eyre Peninsula, which hit 48.2C. Adelaide reached 45C and Hobart reached a record 41.8C – one degree hotter than the record set in 1976. Authorities are urging people to prepare themselves and their properties in case of bushfires. Firefighters in far north Queensland, Australia are working to protect homes from two separate fires near Kuranda, west of Cairns. A new submarine volcanic eruption might have recently started off Turkey’s west coast in the Marmaris Sea between the mainland and the Greek Island of Simi near Rhodes. Scientists from Istanbul’s Technical University announced that they have found evidence of 2 active vents at about 200 m water depth along a north-south trending fissure of 2.5-3 km length. Read more. Earthquake activity at and near Santorini volcano has calmed down again after the brief pulse in quakes mostly along the Amorgos Graben to the NE at the end of December. The Stromboli volcano in Italy continues activity. The western crater produced tall, very noisy, straight candle-like strombolian fountains up to 300 m tall every 10-20 minutes from vent 2, lasting 5-20 seconds, often accompanied by ash-rich ejections from vent 1. Earthquakes continue at El Hierro island under the eastern El Golfo area. The NE part of the island is experiencing uplift detected by GPS, which suggests that a magma intrusion at depth (so far) is the cause of the current swarm. Volcanic tremor is low. The lava flows continue to effuse from the Southern fissure of Plosky Tolbachik volcano in Kamchatka. KVERT reports a slightly increased volcanic tremor amplitude compared to the past days. In other words, the eruption might actually be far from ending. Popocatépetl volcano in Mexico has (temporarily?) calmed down a lot: the number of steam and gas emissions decreased to only 8 recorded during 2-3 Jan, but glow is still being observed at night. Pacaya volcano in Guatemala had an increased phase of fumarolic activity with a steam plume reaching 3,000 m altitude for a few hours yesterday. No other surface activity was noted. Fuego volcano produced 8 weak explosions with ash clouds reaching 3-400 m above the crater and accompanied by faint rumblings were observed during 2-3 Jan. The lava flow toward Taniluya canyon decreased to a length of only 300 meters. The Santiaguito lava dome continued to feed its lava flows, one of which showed some advance. Copahue volcano in Chile/ Argentina continues to emit a steam and gas plume, but no further explosions were recorded. Tiny earthquakes continue to occur beneath Tongariro volcano in New Zealand, showing that the volcano, similar as its neighbours Ruapehu and White Island, is not completely quiet. 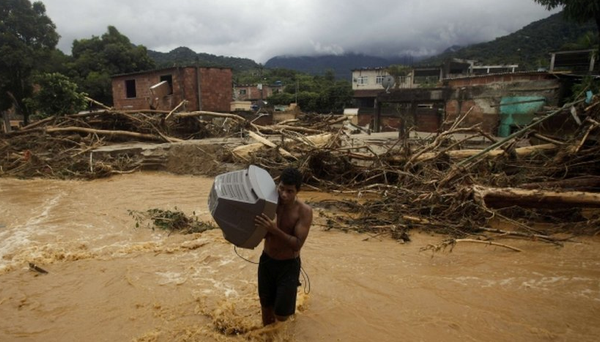 Heavy rain has triggered floods in the Brazilian state of Rio de Janeiro, leaving whole neighbourhoods strewn with debris. At least 130 families have been evacuated in two villages in Dipolog City, Zamboanga del Norte due to floods caused by incessant rain spawned by tropical depression “Auring,”. Tropical storm Sonamu is forecast to strike the Philippines at about 00:00 GMT on 4 January. Thousands of homes on France’s Reunion island remain without power after being hit by Indian Ocean Cyclone Dumile. Both of the island’s airports closed, and shipping was at a standstill. Winds of up to 180 kilometres per hour (110 miles per hour) and torrential rain caused extensive damage. Heavy rainfall has again flooded Sungai Golok, Waeng and Tak Bai region of Narathiwat province. Thailand’s meteorological centre has warned people to remain ashore over the next 1-2 days due to high waves offshore, of up to 2-3 metres. 5.4 Earthquake hits Kepulauan Obi, Indonesia. 5.0 Earthquake hits the Samoa Islands region. 5.0 Earthquake hits offshore Maule, Chile. Bushfire near Richmond in Tasmania. Victoria, Australia under a bushfire warning as heat wave brings extremely hot conditions. One killed and 105 others injured in a heavy storm in Sasolburg, Free State region of South Africa. The storm and heavy rainfall damaged more than 1,000 houses. Tropical Cyclone Dumile strikes Reunion with heavy rains and strong winds. Britain in 2012 experienced its second wettest year since records began in 1910 and extreme rainfall has become more frequent. Persistent wet weather resulted in total rainfall of 1,330.7mm in 2012, just 6.6mm short of the record set in 2000. Preliminary evidence suggests Britain is getting slightly more rain in total and it may be falling in more intense bursts. 5.0 Earthquake hits Kepulauan Sula, Indonesia. 4.9 Earthquake hits southern Sumatra, Indonesia. Victoria in Australia is set to experience some of its worst fire conditions since Black Saturday, with most of the state expecting temperatures above 40°C on Friday, as well as fresh northerly winds. In Victoria’s northwest, Mildura is tipped to have six days in a row above 40°C.